1) Beth and I will be co-hosts of this list. 2) If you do enter your link into the list, please be supportive of the other entrants. 3) Keep us up to date with how you're doing. Update Day is on the last Friday of every month. Even if you don't think you achieved much or anything, write a quick post to say so. We can't encourage if we don't know. 4) When you enter your blog's address write your goal as the link title. For example, my link's title will be "earn $7500 per month." Not your name or your blog's. This is so we can keep track of who's doing what. AND it will serve as an easy indication of the fact that you're not the only crazy one. You're welcome to sign up at any time. 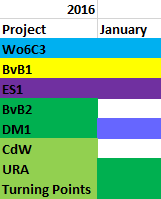 As for how I did in January... not good. I've been required to keep an insane work schedule with the two first weeks having 16 hour work days. Which meant that I mostly slept when I didn't work. 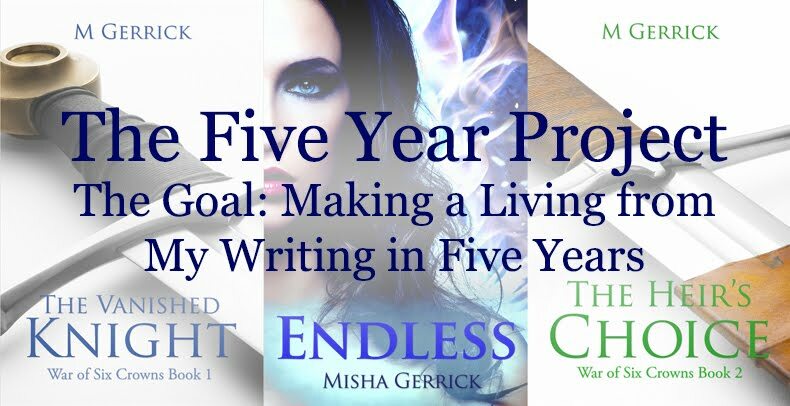 By the third week, things were going better, but I was so exhausted that I just couldn't put in the hours of writing and editing required to achieve my goals. I managed 8877 words, about half of which was edits. I want to see if I can get past 10k this weekend. Didn't start yet. I wanted to, and had some free time, but it felt like I'd lost my train of thought. So I had to reread the whole thing that I've written so far in order to pick up where I left off. 3) Submit "Turning Points" Short Story by 31 January. I got through the actual proofreading, but haven't implemented any edits yet. I'm still waiting for one more CP to send me her feedback before I start. Didn't even think about this yet. I did do a little bit of thinking about this. Which should make the actual preparations easier for me when I get to them. I read three so far, although I might try and see how many I can squeeze into this weekend. Done. BvB1, aka Endless will be out on 30 April. I mostly managed this with blogging, only missing one day because my laptop broke. I didn't get to Twitter, Tumblr and Wattpad the way I had wanted, though. Done. For the most part I'm living off fruit, veg, protein and dairy. Done just in the nick of time. I started lessons yesterday. So all things considered, I don't think I did too badly. Although I really wish that I can get more done. The good thing is that this month should give me quite a few nights off with no internet access, so I should be able to get more done. 1) 60k written, 60 hours edited or a combination of the two. 3) Finish Endless edits and formatting. 1) Finish arranging blog tour. 2) Send out e-arcs to reviewers. 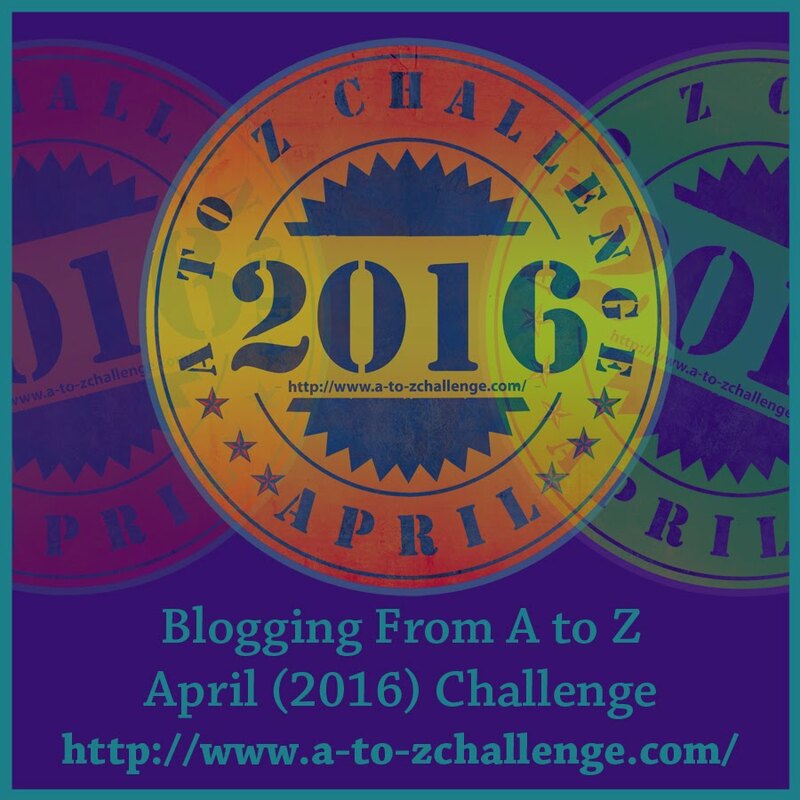 3) Start A to Z Challenge Posts. 4) Start prepping for blog tour. 5) Finish Endless paperback cover. 6) Maintain current blogging activity. 7) Become more active on one more social network. 1) Get into a regular work/life/writing schedule. 4) Find new exercise/sport activity. That's it for me. Lots to do, yes. How are your goals coming along? 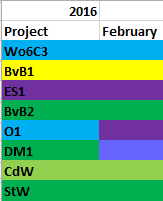 What are your plans for February? When I first imagine a story, … I take time to create in my mind a picture of the setting (being as I am addicted to setting in the stories I read). I love Italy and have spent time wandering around Tuscany, imagining all the turbulent history that this region has seen. The first Gothic novels were set in Italy and it's not hard to see why -- the tempestuous history, the castles dotted all over the countryside, the crumbling villas, the nobility's constant plotting, the cruel papal wars and much more. Extract One and Two are from - The Vendemmia (The Harvest) - when Vipunin is a Duke of the Grand Duchy of Tuscany. "Vipunin … turned, leaned back against the parapets and admired his castello. How beautiful the travertine appeared tonight with the lights reflecting on the pale rose bricks and illuminating the niches where white marble crèche figures shone alabaster. He had rescued these exquisite statues from a crumbling palazzo in Venice when on his yearly visit to pay homage to the Doge. Here at his home they were on display – so finely carved, baroque in proportion – rather than decaying at the bottom of the Canal Grande. Inhaling … the fragrance of grape that permeated the air, he loved how the perfume jostled with the scent of carefully-tended lilies and lavenders from his walled garden. Red roses trailed over the high walls in a bright splash of color, their breath-choking scent lacing the air. At times they overpowered even the smell of roasting pigs that would feed those gathered within his walls this night." In my head I imagined Vipunin's castello as Brolio Castle in Siena, close to where the action in my story takes place in the Chianti region. The castle of Brolio was caught in the middle of … the conflict between Siena and Florence, then it was attacked many times in the seventeenth century, the time of my story. 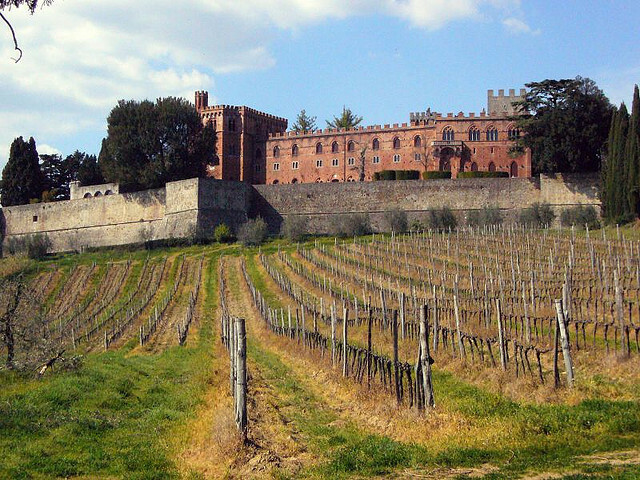 The castle is surrounded by the largest vineyards in the Chianti region. You can walk on the ramparts for splendid sights of the Chianti region, much as I draw Vipunin surveying his 'Dukedom' one fateful night. "Vipunin … gritted his teeth as he recalled the richness of the wine he once drank from his favorite pewter goblet while he watched the sun set over his vines. He could taste it now, wild and musky, swirling around his mouth. Once his life had revolved around the pleasures of the harvest, the pleasures of women, and the pleasures of wine-making. He turned his attention back to the male and female, watched as they sipped from silver goblets engraved with a family crest. A thirst more powerful than his thirst for human blood overcame him. He … drank nothing but blood, but now he longed to pour every delicious drop of that wine down his aching throat." Feel the passion...the longing...the desire…"
"Eternal life in the dark world is forever the moment of transition from light to darkness, an ageless and inescapable fact of a Vampire’s existence, in which the past is often a haunting and taunting memory. Tense, engrossing, and chilling." You think you've read vampire tales before. You haven't. Not until your eyes feast on Under The Tuscon Moon. I know you want to read this luscious story of intrigue and vampires. Buy it. I give it five stars. Cheers to Ms. Covey for this most original, beautiful story of love and vampires. Denise Covey hails from that land Down Under, where she publishes flash fiction, short stories and travelogues in Australian magazines. When not writing, she teaches English Lit to her rapt senior students who think it’s 'way cool' to have a writer as a teacher. 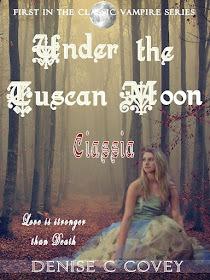 Under the Tuscan Moon is her first, but not last, paranormal romance. Denise has decided it’s 'way cool' to live in a world of vampires, angels, demons and werewolves. What about you, ladies and gents? Where is your current WiP set? If you're not working on anything, where is your favorite place in the world? Before I go, please go check out my newest book announcement. 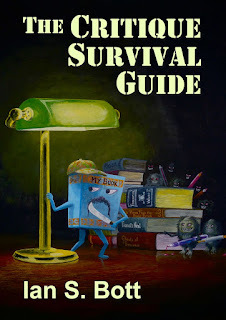 I'm looking for some more blog tour stops. Pretty please? Lately, my advice posts have fell a bit to the way-side. Mainly, I blame a bit of a writer's burn-out that I suffered from since mid-November. The only thing I advise people to do when burned out is to rest. But what to do when the burn-out is gone and you just can't get into the writing groove again? Oh, I'm glad you asked. I'm serious. Resting during a burn-out is all about spoiling ourselves rotten and doing all those things we usually do to procrastinate without feeling guilty about it. This is a good thing in its time, but now that time is over. But why promise yourself a reward when you're already in the zone of instant gratification? It just won't work. So find what will really make yourself feel crap if you don't do it within a certain time, and commit to it now. I picked saying yes to two anthologies and setting up a book for pre-order. Of the two, the pre-order thing is worse. I like having the pre-order option. And Amazon will take that option away for a year if I don't submit the finished work in time. See? Pretty big stick. And already, I've started making sure that I'll have everything done. Just make sure that the big stick won't be falling too soon. You've got to be reasonable. Setting something up for pre-orders a week from now isn't reasonable unless you were close to done to begin with. You used to do this before. It's not so hard. Say: "Yes, I want to watch TV, but first I need to finish this chapter." This is a tricky thing to do, because the excuses are a dime a dozen. But if you want to get that book done, you need to say: "Later." to everything that isn't finishing your book. Except, you know, your family needing your attention or something like that. Family is important. Writing is important. Sometimes, friends are important. TV.... not so much. And be careful of the social networking you "need" to do. Not that important either. That's the nice thing about delayed gratification. Telling yourself you'll do something after finishing a chapter means that you'll want to finish that chapter even if it's only to get to a guilt-free session of that other thing. I go a bit bigger, though. I've promised myself something really nice and expensive if I publish my book on time. Actually, that was a new laptop, but the old one broke. So I'm going to have to think of something else. In the short term, I promised myself a decadent chocolate and banana smoothie once I've finished this post. You know? It's kind of important. And that's pretty much it. Simple, right? Back to the subject of putting books on pre-order. I'll be putting Endless up on Amazon this weekend. It's already up on B&N, Kobo and Apple. In the meantime, though, I'm looking for people who'd like to help me spread the word in May after the launch. If you're interested, please click here. Thanks! You're awesome. Hi everyone, welcome to News Day. For those of you who missed it, News Day is my weekly regular feature where I share news that I've found in the bloggosphere or that has been brought to my attention. The news can be about anything from book releases to bloghops and anything in between. If you'd like for me to share something on News Day, please mail me at mishagericke(AT)gmail(DOT)com with NEWS in the headline. 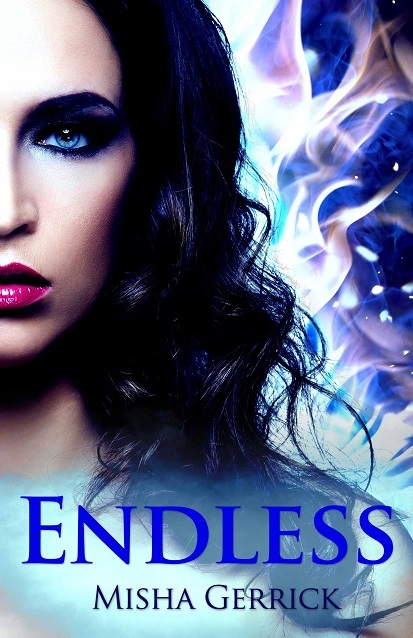 In case you missed it, I've announced my release date for Endless on Friday and am currently looking for people who'll help spread the information once the book is launched. You can find more information and the google form I'm using here. 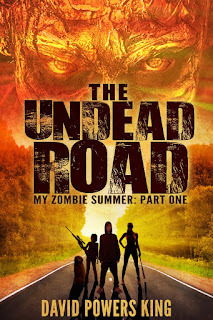 Yesterday, I interviewed David Powers King as part of his blog tour for The Undead Road. Please go read the interview and support him, since he's a great person who definitely deserves some love. Denise Covey will be here, writing about Setting and Story. Mind over matter is more than a cliche. Controlling starships with her mind is all Emily ever dreamed of. Her graduation from the Telekinesis Traffic Control Academy is assured, unless Dylan, an irritating and cocky fellow student, ruins it for her. 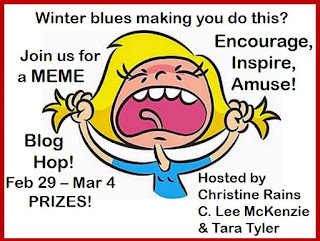 Christine Rains, Tara Tyler and C. Lee McKenzie are hosting a Meme Bloghop in February. The rules are simple. Post a meme, visit others and smile. The hosts will be giving away prizes. Sign up here. T.F. Walsh is creating a community for writers and readers of romance. You can find them on Facebook, Twitter and Instagram. Hi all! So this was most certainly not in my schedule, but on Friday, David mailed me. One thing led to another, and we did an interview over the weekend that I decided to share today. Before I get to that, though. If you haven't seen my announcement on Friday yet, please go check it out. I'd love you forever if you could help. Welcome to The Five Year Project, David! Let's start with an easy (or fiendishly hard, depending on your point of view) question. Tell the readers a bit more about yourself? Much about be can be summed up by the words of Jake the Dog: "I'm just a simple dude." 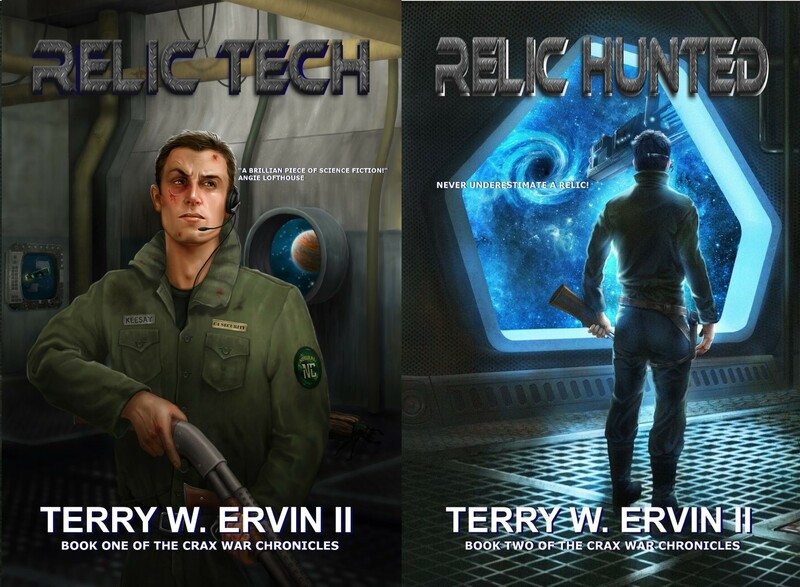 I love all things science fiction and fantasy, and I write all kind of things. I happen to be a mental health professional as well. You could say I'm a mixed bag of tricks with dollop of awesome on top. Plus I live in the Rockies. Like Bilbo, I gotta have my mountains. Do you use your mental health knowledge in characterization? How? Is it something you do consciously? Always. In fact, when I was in college going for a Behavioral Science degree, people were surprised that I wasn't going for a degree in English since I wanted to be a writer. But here's something I've learned ... If people are invested in the characters, the prose will take care of itself. Having a background in the field of psychology makes complex character creation a cinch. It makes me a more effective people watcher, too. Don't call the cops on me. I LOVE people watching. Bonus points if I don't get caught. Do you make up stories about the people you notice? Usually, but it can take a lot for something to grab my attention. Even The Undead Road is something of a caricature of my 15-year-old self, using memories of events and people I knew back then. What inspired you to write The Undead Road? Zombies are my favorite monster, yet for the longest time I couldn't think of a way to write them the way I've always wanted to see them (more family oriented and presented in a way that people who don't like zombies would still enjoy the story). The first episode of The Walking Dead was huge in breaking that wall, and I wrote the first chapter that night. So would you say this was an easy story to write? I would say the easiest of all my works. It flowed like water. Perhaps I wasn't approaching it as seriously as other projects and just had fun writing it. Then my critique group liked it so much, they pushed me to get it published. And here we are! I love when a story like that comes along. I adore my challenging books, but sometimes, it's important to just let something flow out too. Even if we don't take it as seriously. What is The Undead Road about and where can people buy it? It's about a 15-year-old boy named Jeremy, whose family is seeking refuge from the deadly Vectors halfway across the country. They have to get there first, and find themselves caught in the struggle for a possible cure and a girl who might turn on them at any moment. 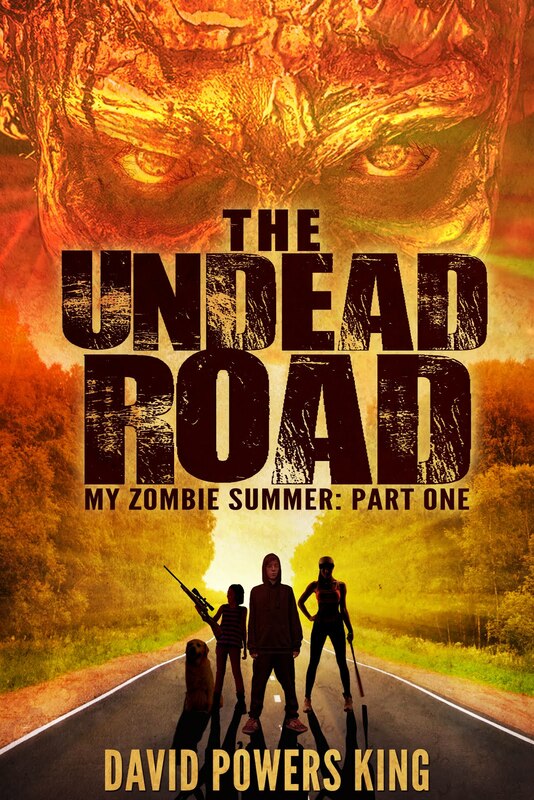 You can find The Undead Road on Amazon: Kindle (.99 all this week! ), free on Kindle Unlimited, and paperback, as well as the Createspace store. Sounds awesome. Where can people find you? Do I want to be found? Hey, why not! 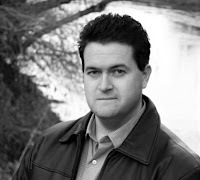 You can find out what I'm up to at www.davidpowersking.com, as well as Facebook and Twitter. Follow the space guy with a cruller in his hand. Excellent. Thanks so much, David! All the best with The Undead Road. What about you, dear reader? Which is your favorite monster? Who loves zombies? Launch Date will be 30 April, which means that I'm looking for people to help spread the word in May. (I won't be asking people to host me during A to Z Madness.) Pretty pretty please with a million sprinkles on top? Hi everyone! 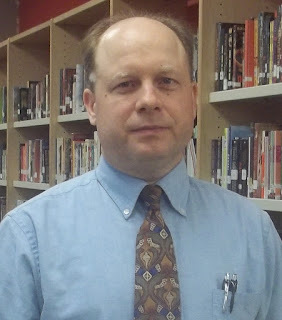 Today I'm welcoming Terry W. Ervin II to the Five Year Project. Today's a bit of a long post, but chock full of information, so I'm just going to let him take over from here. Once a week (usually Tuesdays), I post news bits that I've gleaned from my blog visits or that I've been informed of. The news can be about anything in our writing blogger community, so if you would like me to signal boost anything you'd like to share, please mail me at mishagericke(AT)gmail(DOT)com with News in the subject line. Announcement on Friday: Don't forget to come back on Friday for an important announcement! 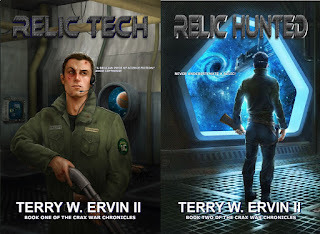 Thursday Guest Post: Tomorrow I'll be featuring a guest post by Terry W. Ervin II. This is part of my plan to regularly feature writers on Thursdays. I have all my Thursdays open in February, so if you'd like to book one, please mail me at mishagericke(AT)gmail(DOT)com with "Guest Post" in the subject line. She didn’t believe in heroes until he kidnapped her. Infamous smuggler Quin kidnaps Dr. Bess Smith with the best intentions. But a few days in the feisty physician’s presence turns his thoughts in a less honorable direction. Soon he’s figuring out ways to keep her. Bess isn’t impressed with Quin’s good looks and easy charm until she starts to believe he is sincere in his flirtation. Despite the grim medical emergency they battle together, for the first time in her life, she experiences the thrill of adventure with the handsome smuggler. Then a terrible betrayal exposes the secrets they’ve kept from one another. Secrets that may cost Quin his life and send Bess back into the isolation of her research laboratory. Can she trust a man she believes only used her own ends? Or is he really the self-sacrificing hero she hopes he is? 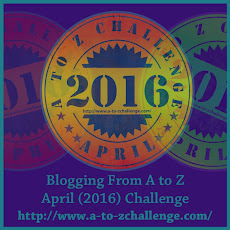 You probably know about this by now, but sign ups for this year's A to Z Challenge will open on 25 January. The first issue goes out on February 24th. The Valentine's Day Muse Party Blogfest will take place on Monday, February 15. 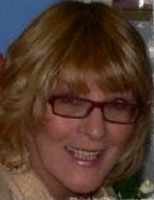 Sarah Foster will be hosting the party on her blog and you and your muse can come! On that day you can post on your blog and answer the questions she provided. She'll be answering them, too, and visiting all the other blogs to check out your answers! Sign up form and questions can be found here. Annalisa Crawford got shortlisted for a prestigious competition. DL Hammons is looking for help with reading the slush pile for WRITE CLUB 2016. That's it for today. Got any news for next week? 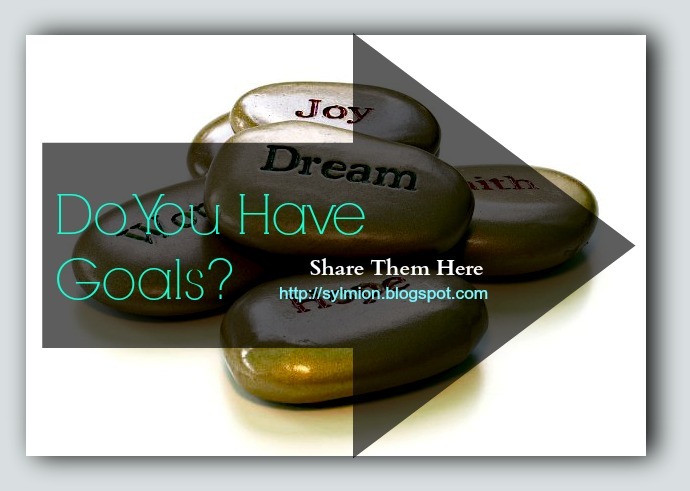 Want to guest post on my blog? Don't forget to mail me. 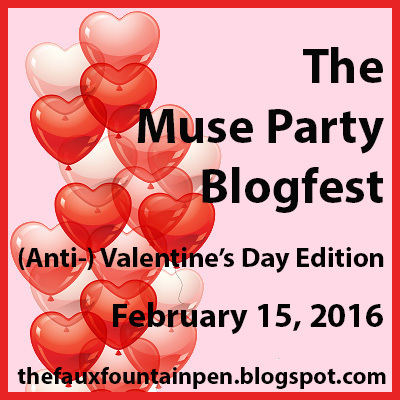 Anyone else signing up to the Muse Party blogfest? I'm visiting Beth Fred today. Hello from the new year!